Three people have been killed and more than 600 wounded as anti-government demonstrators and supporters of Egyptian President Hosni Mubarak clash in Cairo. Anti-government demonstrators and supporters of Egyptian President Hosni Mubarak clashed repeatedly in Cairo on Wednesday leaving three people dead and more than 611 wounded. After dark, the two groups faced each other in the city's Tahrir Square. Many flaming projectiles were thrown and some demonstrators set up barricades to protect themselves. CBC's David Common said a large amount of gunfire could be heard in the square. The gunfire appeared to be coming from military forces who were firing into the air, he said. "There is chaos in the streets of Cairo tonight," he said. The opposing demonstrators ignored an order from the government to go home. At around 4:15 a.m. local time, sustained gunfire broke out in central Cairo sending people running, CBC's Nahlah Ayed reported via Twitter. Egypt has been in upheaval now for nine days. On Tuesday, Mubarak said he would not run in September elections, a move that will end his 30 years in office. However, anti-government protesters keep insisting Mubarak must step down immediately. Wednesday was the first day since the demonstrations began that pro-Mubarak groups turned out in large numbers to confront the anti-Mubarak side. 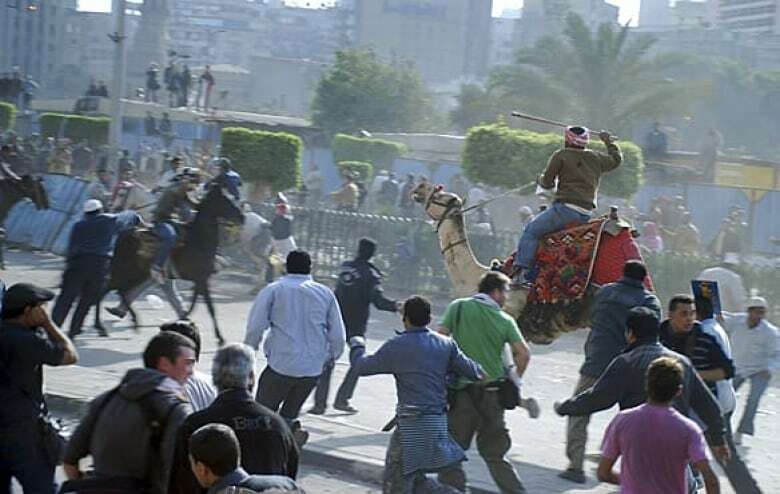 Health Minister Ahmed Farid said two young men were taken from Tahrir Square in ambulances. He said one man was already dead, while the other died in hospital. The third man died when he fell from a bridge near the square. Farid said the man was wearing civilian clothes but may have been a member of the security forces. Analysis: What's at stake for U.S. Profile: Mohamed ElBaradei — Egypt's president-in-waiting? Canadian travellers: How safe are Canadians abroad? Earlier Wednesday, chaotic crowds tussled in the streets, and video footage showed angry demonstrators tossing stones, bottles and firebombs at each other. One group of demonstrators entered a building and tossed the contents on the people gathered below, Common said. "Chairs, rocks, bricks," he said. "We've seen ambulances go in and out but it's just nowhere near enough to deal with the people being injured." He said teargas had been used and there were reports of gunfire heard in the street. The Associated Press reported that soldiers did nothing to stop the violence beyond firing an occasional shot in the air and no uniformed police were in sight. "We are seeing very little role for the police or the army this evening," Common reported. In Ottawa, MPs will hold an emergency debate in the House of Commons on the crisis in Egypt on Wednesday. Foreign Affairs Minister Lawrence Cannon told reporters he had received assurances from Egyptian officials that Canadians in Egypt would be allowed to leave the country safely. So far, 449 Canadians have left on five flights chartered by the federal government. However, there has not been an exodus of Canadians in Egypt wanting to leave, he said. In Washington, White House spokesman Robert Gibbs told reporters that immediate transition was needed in Egypt, and "it must include opposition voices as we move toward free and fair elections." The Obama administration "strongly condemns the outrageous and deplorable violence that has taken place on the streets of Cairo," Gibbs said. Several foreign journalists were injured in the melee, including reporters from Radio-Canada, CNN, The New York Times and The Associated Press. Some were directly attacked while others were just in the wrong place at the wrong time. Radio-Canada reporter Jean-François Lépine and cameraman Sylvain Castonguay were roughed up by pro-government supporters near Cairo's airport. Castonguay was badly beaten, and the attack only ended after soldiers intervened. 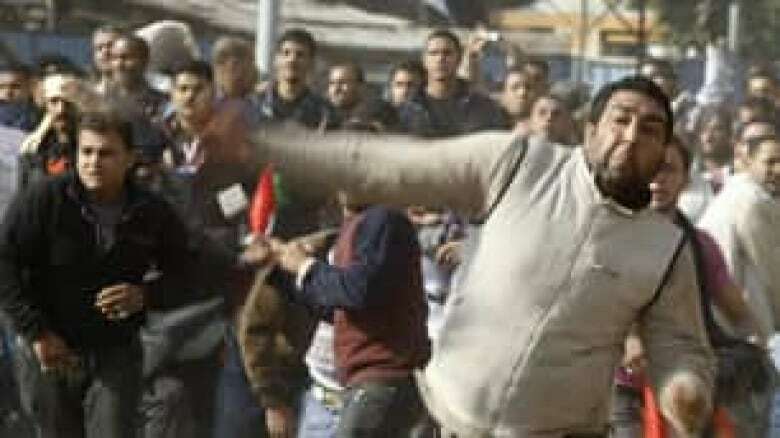 Ayed was in the area when the clashes between the pro- and anti-government sides broke out and reported seeing people throwing stones at their opponents. "People just spilled into each other and there was direct hand-to-hand clashing between the two sides," she said. The turmoil began after a military spokesman issued a statement Wednesday calling on anti-government demonstrators to clear the streets and go home. 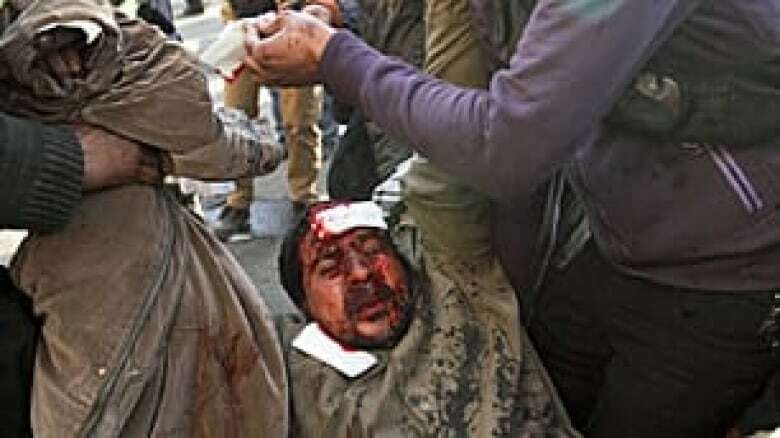 An injured anti-government protester is carried away from clashes in Tahrir, or Liberation Square, in Cairo on Wednesday. ((Tara Todras-Whitehill/Associated Press))"Your message has arrived, your demands became known … you are capable of bringing normal life to Egypt," military spokesman Ismail Etman said Wednesday, a day after Mubarak said he would not run in the upcoming presidential election. After the statement, state television ran a scrolling message reading: "The Armed Forces call on protesters to go home for the sake of bringing back stability." However, many people on both sides ignored the call for calm and returned to the streets. CBC's Susan Ormiston spent part of the day in west Cairo, where thousands of Mubarak supporters had gathered. "They finally came out en masse today, very loud, very anxious to get across the word that President Mubarak's speech last night changed the game here," Ormiston reported. "They are satisfied with what he said — that he'll go, just not yet — and they want to give him his orderly transition," Ormiston said. However, some of of the anti-government demonstrators feel change isn't coming fast enough. Nada Saad said she felt a small sense of victory after Mubarak said he won't run again, but fears he'll use the time to arrange a succession to his liking. Ayed noted that some of the people who took to the streets Wednesday were neither totally for nor against the current government. "They are so poor that they must earn their living, and those people got very frustrated over the last few days," she said, noting that some people in the streets suggested they were upset with the economic turmoil and disruptions caused by the days of demonstrations. UN Secretary General Ban Ki-moon condemned the violence in Cairo, while the U.S. reiterated its call for restraint. Meanwhile, reports said internet services were back online Wednesday, days after the government ordered an unprecedented cut-off. Protesters first took to the streets on Jan. 25, emboldened by unrest in nearby Tunisia, mounting a once-unimaginable series of demonstrations across this nation of 80 million.